Home Places Europe Ciao from Venice! I am sorry to have missed a couple days of reports. I am already getting emails from friends asking if I was alright.. Sometimes I am just having to much fun to write and sometimes there is no internet where we are staying. So to get you caught up…. Two days ago we took off with our Swiss friends and rode around Lake Como to Bellagio, (the real one, not the tacky version in Las Vegas). The ride there was about an hour, along the lakes edge passing one beautiful villa after another. When we arrived it did not disappoint. Beautiful old world elegance everywhere. We spent about an hour there doing a bit of shopping, photography, and finished off our visit with an espresso. From there we rode onto a local ferry which smoothly transported us and our motorcycles across the lake to another picturesque town. We rode another half an hour around the lake to the Moto Guzzi motorcycle factory and museum. I am beginning to understand why Italian motorcycles are so rare,,,, they hardly work. Twice I have tried to visit the Ducati factory and they have been closed for various reasons. We went on the Moto Guzzi factory website the night before and it stated they were open and the museum was open 6 days a week.. What they forgot to mention was it was open one hour a day, from 3-4pm! Since we got there around 1pm none of us wanted to wait 2 hours for it to open and the production factory was closed, for some reason.. I guess there are too may Guzzi unsold?? We said good bye to our Swiss friends, they thought they had a two hour ride home in Switzerland.. Later that night I saw on Facebook that they got so lost they wound up spending the night in a hotel. They couldn’t find their way home and they live here!! We had an uneventful ride down the mountain from Lake Como to the A4 highway which crosses northern Italy. Northern Italy is one of the richest parts of Europe due to all the manufacturing there. The A4 highway crosses this area and it was not a particularly beautiful or fun ride. Just a congested highway (Similar to our Freeways, except they are not free and you must pay tolls every so often). By the end of the day we found a hotel that I would say was a quality 1/2 star. Nothing to write home about but it was close to the highway and close to Venice which was our next stop. The next morning we got off to an early start and made our way to Venice. By the time we arrived, parked the bikes in a secure lot, and made our way to the island city it was mid day. I have to say I was quite happy to see my wife, Bonnie after three and half weeks on the road. Bonnie had arranged 5 rooms at the Orsoni B&B, part of the world famous Orsoni glass company. What was great is the place only has 6 rooms so it was like staying in a private home. Our room had a patio out side and over looked gardens and the Orsoni glass works. An absolutely beautiful location. We promptly put the patio to good work with wine, cheese, and other local delicacies… After a couple of hours of wine indulgence we all retired to our afternoon nap.. That evening we started exploring the city. When you arrive in Venice it is like instantly traveling back in time. Many of the buildings there were built before Columbus sailed to the new world! I am sure every room in the city has amazing stories behind it. Centuries of people living there, exploring the world, and starting various wars and coos. Great artists, actors, royalty all lived there. The next day Bonnie, Kim, and Robin (Bonnie’s oldest friend) and I went out to explore more of the city. Duane went to the Venice airport to meet his wife and my daughter Sarah, who escorted her to Venice. Sarah scored because Duane basically paid her way to keep Duane’s wife Linda company since she hates to travel alone. Duane’s wife Linda immediately installed a proper sling (which she brought) on Duane’s broken arm. Hopefully a week of rest and no use will give it some time to heal. Now if we can only keep Duane from hurting himself more. Today Duane went to a local pharmacy to get some pain meds for the pain in his broken right arm… As he stepped into the pharmacy he tripped on a cobble stone and as he fell forward he put a nasty gash on his good left arm. Lots of blood but he seems to have survived it…. Again as soon as they arrived it was time for afternoon wine… After a bit of wine, an nap, and we were all ready to go out again. We found a wonderful outdoor cafe and had a wonderful Italian dinner with of course more wine… Then we walked around the city in the cool night air. It was wonderful! One of the great things about this trip is the chemistry with all the people is great. Duane and I have had no problems that one to ten glasses of wine wont fix and all the ladies are wonderful. Tomorrow we start the serious sight seeing with a walk to St. Marks square. If you don’t hear from me for a day or two, relax I am not riding my motorcycle and we are just enjoying ourselves! Sorry but due to the very poor internet here I cannot post the photos in any particular order. So they are what they are. A moment earlier they were walking down the street hand in hand as a couple.. Got to love the Italian way of life. 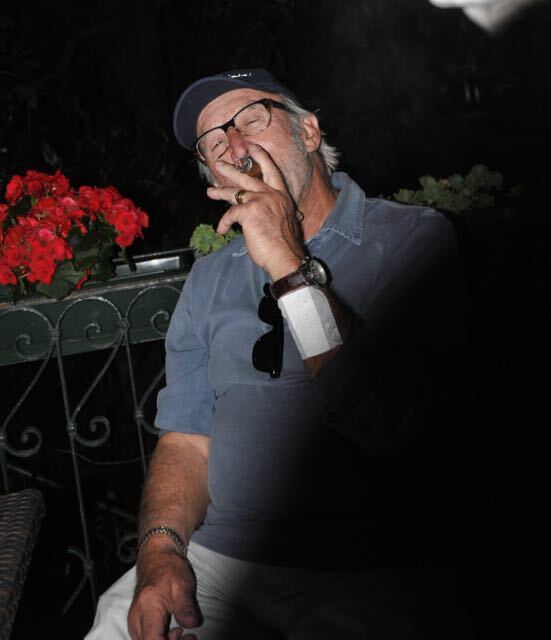 Duane enjoying a Cuban and showing off his latest injury. While going to a pharmacy to get a pain killer for his broken right arm he tripped and gashed his left arm. We are going to wrap him in bubble wrap and call him Bubble Boy. Time for some open air market shopping. Life long friends since age 5! The Italians know what size to make a wine glass! Just one glass of one tonight……Sounds reasonable? How can McDonalds desecrate Venice with their food, worse than the graffiti below! Got to have gondola photos when in Venice?? You got to love Italian style! I think these outfits would work for me, just have to decide which one.?? I’ve never seen this before, paddle boarding in Venice. Looks like fun but I would not want to fall into the canal water.. Not exactly clean. I teased the ladies about shopping then spent the most on this Jaguar themed watch.. Of course it was a business expense ..
Every little detail in Venice from sign to lamp posts have such beautiful details. Even Venice has a Chinese restaurant. I happen to like Chinese food but it is amazing no matter where you travel in the world there is a Chinese restaurant.! All these fish and seafood are actually baked goods. Really??? Go to Venice to buy Disney crap?? Kim makes friends with the local police where ever we go. 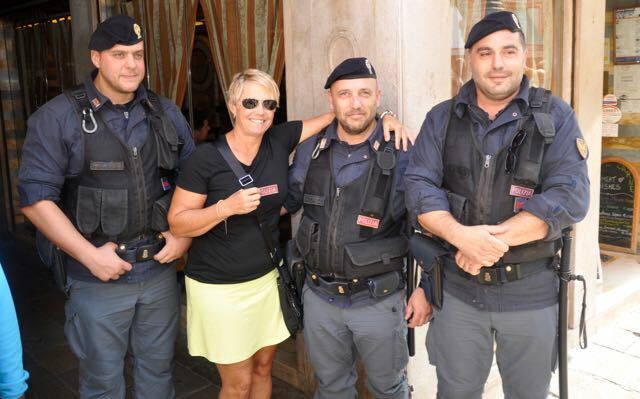 When she told them she was a retired police officer they were so excited they gave her a Venice POLIZZI badge..
Next articleVenice, Lambo, Ferrari, Pagani! Lubbock Texas! Just wanted to mention keep up the good work! Great site. A lot of helpful information here. I am sending it to a few buddies ans also sharing in delicious. numerous varied angles. Its like women and men are not fascinated until it’s something to accomplish with Woman gaga! I just want to tell you that I am very new to blogging and truly savored your website. Likely I’m likely to bookmark your site . You surely come with beneficial well written articles. Regards for revealing your webpage.